I was tired of the bike and scooter mess in my third garage. 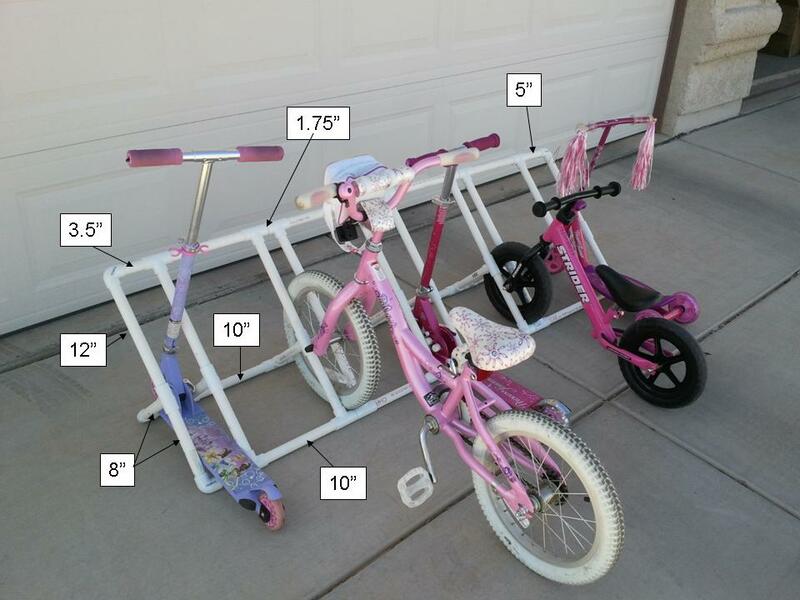 I had been shopping around to see if there was any kind of small bike rack I could use in my garage, but they were a little out of my price range. So, I searched on the internet some, and came across a few plans to make a bike rack out of PVC pipe. I recently used PVC pipe for a sign project for Bountiful Baskets, and it was really easy to work with, so I decided to give it a try. You may opt to use PVC cement to hold it together, but I did not use any at this point. It is staying together well, plus, I want the option to adjust, add, or take away as we get new scooters or bikes. You also will need a way to cut the pipe. There is a pipe cutting tool available, shown below. This one was $9.97 at Lowe’s. 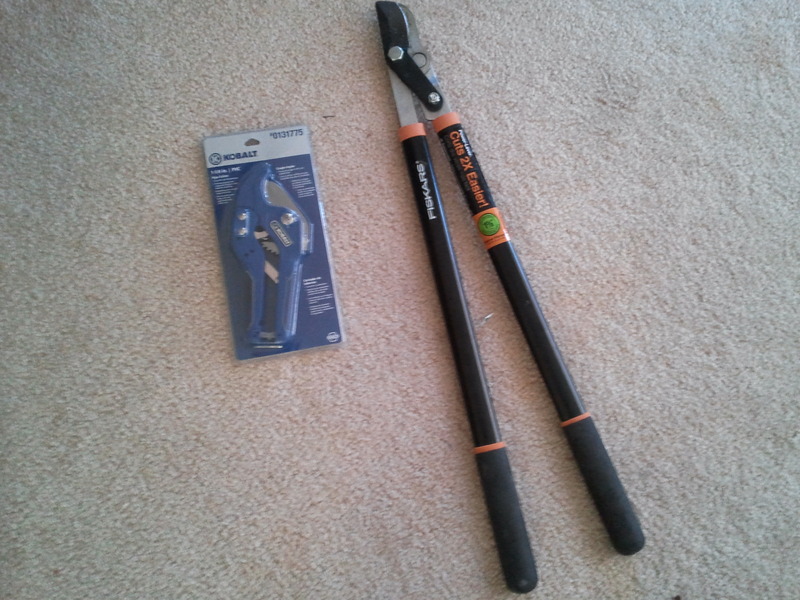 I bought it, but will probably return it since I was able to use my tree cutting tool, also shown below, with success. You can also use a small hacksaw to cut the pipe. If you decide to use 1″ PVC pipe instead of 3/4″ PVC pipe, you may need to adjust the measurements slightly, and the cost will be a little higher, but shouldn’t be too much more. This was a really fun project for me. It took a little trial and error to get the openings the right size, but after that, it went pretty smoothly. This turned out to be the perfect size for the opening of my third garage, so we can easily open up the garage and get the bikes and scooters out right away. I also made sure to get my kids involved. My older daughter counted out the number of tees and elbows from the plans I drew up, then both my daughters helped me count out the items we needed at the store. I did all the cutting, but they were able to help with the assembly. I have found some other neat PVC ideas online, so we may be doing more projects like this in the future! Thanks for the mention! Love how yours turned out. You’re welcome! Thank you for the inspiration! Great bike rack! Just a tip from a fellow DIYer. Electrical PVC is the exact same material. It’s grey and runs about 20% cheaper. It’s doesn’t make a huge dent in a small project, but can save you a pretty penny if you re-do your sprinklers. Thank you so much for posting this. We just finished making one. In all (from buying to putting up) it took us probably 1 1/2 hours (if that). Only cost me 30$ and I was able to put three scooters and four bikes in it. Thank you! I am pinning this for others! Awesome! Glad to hear this helped! I know mine has helped keep my garage a little less crazy! Just made this bike rack for my bigger kids’ 6 bikes. You gave just the right info — thank you for taking the time to post. Great plans. Very helpful! Kelley – You are welcome! So glad to hear that it this was helpful! 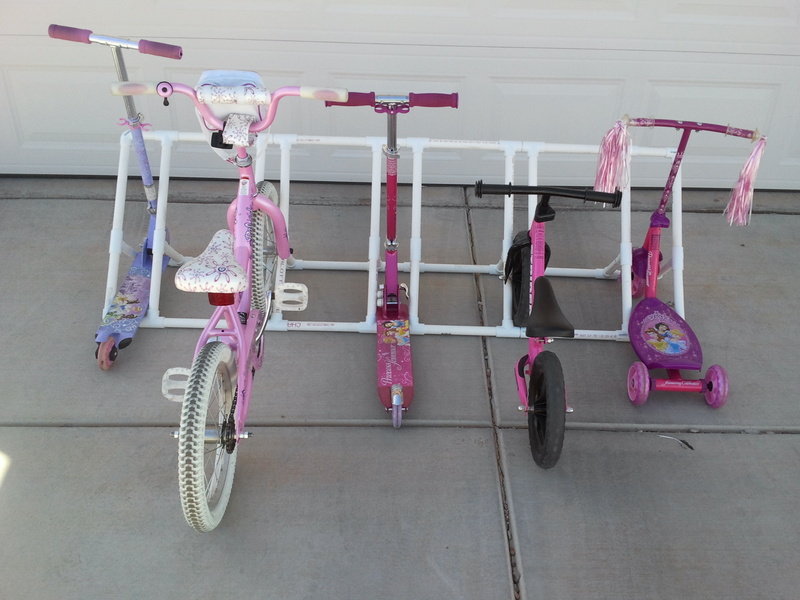 Thank you for sharing your PVC bike rack plans! Our 7-year old son and I constructed one this past week. It looks like it will work great! (Notes from our experience: the pic and cut list show 3.5″ width for scooters, but we ended up using 3.75″. There was a discrepancy between the pic and materials cut list on bicycle slot width. We found the 1.75″ width perfect for all of our bicycles. We didn’t use a slot for the wider scooter, so we replaced the 5″ sections with 3.75″ pieces.) We are looking forward to doing more projects together. Thank you for helping us find order amidst chaos in our garage!